Contemporary church-goers are largely physicalists, if not outright materialists. They have been so influenced by naturalism and behaviorism that they actually believe brains can think: Stomachs digest, livers secrete, and brains think. To them, the arguments of this book will come as a shock. 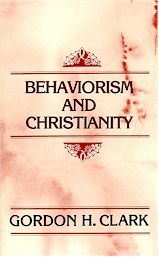 But theology does not require brains; it requires a mind or spirit; and behaviorism, whether it calls itself Christian or not, is a denial of the Gospel.